The aims of this study were to investigate the effect of swimming exercise and/or melatonin administration on liver function as well as certain metabolic aspects in a fructose-induced metabolic syndrome (MS) rat model and to determine whether the combined treatment provides higher protection than each treatment alone. MS is a major health challenge that leads to many complications including hepatic dysfunction. This has raised attention to the possible strategies for its prevention. Eighty, adult, male albino rats were equally divided into two main groups: group I received a standard rat chow diet, and group II received a fructose-rich diet for 6 weeks to induce MS. Rats of group I were equally subdivided into four groups: sedentary nontreated control, swimming exercise-trained control, melatonin-administered control, and combined swimming exercise-trained and melatonin-administered control groups. Similarly, rats of group II were equally subdivided into four groups: sedentary nontreated fructose-fed, swimming exercise-trained fructose-fed, melatonin-administered fructose-fed, and combined swimming exercise-trained and melatonin-administered fructose-fed groups. After 6 weeks, body weight change was assessed, and blood samples were collected for biochemical analysis. Next, arterial blood pressure was measured. Finally, rats were killed, and the liver was excised for biochemical and histopathological examination. Feeding a fructose-rich diet for 6 weeks induced MS with fatty liver in rats. Swimming exercise and/or melatonin improved most of the harmful effects in fructose-fed rats. Both swimming exercise training and melatonin administration may provide a new strategy for MS prevention. Fructose sugar has recently received attention, as its consumption has significantly increased in our diets. Fructose is commonly used as a sweetener, because it is sweeter and cheaper than glucose or sucrose . Experimental and human studies suggest that high fructose intake is an important nutritional factor for the development of metabolic syndrome (MS) and its associated complications. High fructose-fed rats are recognized as good models for MS; however, a few reports have described the histopathology of the liver with respect to MS . Nonalcoholic fatty liver disease (NAFLD) represents the most common hepatic complication strongly linked with obesity . There is no internationally agreed definition for MS. The most commonly accepted definition is based on criteria proposed by the American Heart Association/National Heart, Lung, and Blood Institute. It states that MS can be diagnosed by the presence of three of the following: central obesity, elevated triglycerides (TGs), reduced high-density lipoprotein (HDL), elevated arterial blood pressure (ABP), and elevated fasting blood glucose . The present definition of MS does not include hepatic steatosis despite evidence supporting this association . A link between disturbed circadian rhythm and metabolic alterations is suggested as one of the major causes of MS ; therefore, melatonin may play a role in MS improvement. In addition, it is important to focus MS treatment on lifestyle changes, especially increased physical activity . Hence, we aimed to investigate the possible role of swimming exercise and/or melatonin in preventing high fructose diet-induced changes in a rat model. The present study was conducted at Medical Physiology Department, Faculty of Medicine, Menoufia University, Egypt. It was approved by the Research Ethics Committee at Faculty of Medicine, Menoufia University. Eighty, adult, male albino rats of a local strain, weighing 150–180 g each, were used in this study. Rats were housed in standard conditions with a natural light–dark cycle and were caged in wire-mesh ventilated cages (10/cage) with free access to food and water throughout the study period. Rats were randomly divided into two main groups. Rats of this group were kept sedentary, and were intraperitoneally injected with 1 ml of 1% ethanol in saline (vehicle of melatonin), daily for 6 weeks. Rats of this group practiced swimming as described below and were intraperitoneally injected with 1 ml of the vehicle as in group C.
Rats of this group were kept sedentary, and were intraperitoneally injected with melatonin at a dose of 5 mg/kg body weight dissolved in 1% ethanol in normal saline, daily for 6 weeks. Rats of this group practiced swimming as in the EC group and were injected with melatonin as in the MC group. Rats of this group were kept sedentary, and were intraperitoneally injected with 1% ethanol in normal saline, daily for 6 weeks. Rats of this group practiced swimming as described below, and were injected with 1% ethanol in normal saline, daily for 6 weeks. Rats in this group were kept sedentary, and were intraperitoneally injected with melatonin (5 mg/kg body weight), daily for 6 weeks. The dose of melatonin used was supposed to be therapeutic according to Kitagawa et al. . Rats of this group practiced swimming as in the EF group, and were injected with melatonin as in the MF group. Swimming was practiced in cylindrical tanks filled with temperature-controlled water (30–32°C), 3 days/week for 6 weeks, with each session lasting for an hour (10:00–11:00 a.m.). At the end of each session, animals were dried and kept in a warm environment. On the days of exercise practice, sedentary animals were removed from their cages and kept for 1 h in dry tanks similar to those where swimming sessions took place to handle stress. To minimize the acute effect of exercise, trained animals were killed 48 h after the last swimming session . At the end of the experimental period, body weight change was assessed; animals were fasted overnight to collect retro-orbital blood samples to measure lipid profile [serum cholesterol, TG, low-density lipoprotein (LDL) and HDL], fasting blood glucose, insulin level, serum malondialdehyde (MDA) level, serum uric acid level, serum liver enzymes (alanine transaminase, aspartate transaminase, alkaline phosphatase, γ-glutamyl transferase), and homeostatic model assessment insulin resistance (HOMA-IR) index. Thereafter, rats were subjected to invasive measurement of ABP. Finally, all rats were killed and the liver was excised. Liver weight, liver/body weight, and visceral, epididymal, and retroperitoneal fat weights were estimated. One hepatic lobe was prepared for histopathological examination, whereas the other lobe was homogenized using potassium phosphate buffer, pH 7.0, for biochemical measurement of the antioxidant enzymes – glutathione peroxidase (GPx) and superoxide dismutase (SOD) – or using PBS, pH 7.4, for biochemical measurement of catalase, nitric oxide (NO) (in form of nitrite), and tumor necrosis factor-α (TNF-α). D-Fructose (Technogene Company, Dokki, Giza, Egypt), melatonin (Bio Basic Inc., Markham, Ontario, Canada), thiopental sodium 500 mg (Sigma-Tec Pharmatheotical industries, 6 October City, Egypt), insulin ELISA kit (DRG Instruments GmbH, Marburg, Germany), kits for estimating serum MDA, GPx, catalase, SOD, NO, serum liver enzymes, and fasting serum lipids (Biodiagnostic Company, Dokki, Giza, Egypt), and Rat TNF-α ELISA kit were used (Assaypro LLC, St Charles, Missouri, USA). PBS solution and potassium phosphate buffer were used for various analyses (Biodiagnostic Company). Blood samples were collected from the retro-orbital venous plexus, using a nonheparinized capillary tube. Blood of 2 ml was collected, left for clotting at room temperature in a water bath for 10 min, and then centrifuged at 4000 rpm for 10 min. Serum samples were collected and frozen at −20°C. Before dissection, tissue samples were perfused with saline solution to remove any blood clots. Part of the tissue was homogenized in 5 ml cold PBS solution/g of tissue and the other part in 5 ml cold potassium phosphate buffer/g of tissue. centrifugation was carried out at 4000 rpm for 15 min, and the supernatant was removed and stored at −80°C for assay. Animals were anesthetized by an intraperitoneal injection of thiopental sodium (50 mg/kg body weight), and the aorta was identified and cannulated using a cannula prefilled with heparinized normal saline; the other end of the cannula was connected to a three-way stopcock saline-filled syringe, which was connected to a pressure transducer, and the ABP was recorded using a physiograph system (Narco Bio-Systems, England, UK). One lobe of the liver was removed, fixed in 10% formalin solution, processed by paraffin embedding, stained with hematoxylin and eosin (H and E), and prepared for histopathological examination by light microscope. SPSS, version 16 (Chicago, USA, SPSS Inc.) was used for data analysis. The results are expressed as mean ± SD. The significance of differences between groups was determined by one-way analysis of variance and post-hoc Tukey's test was carried out. P values less than 0.05 were considered statistically significant. In the present study, the F group showed significantly higher fasting blood glucose (114.6 ± 13.3 vs. 90.4 ± 6.9 mg/dl), serum insulin (33.2 ± 5.8 vs. 16.6 ± 4.8 μU/ml), and HOMA-IR index (9.3 ± 0.8 vs. 3.6 ± 0.9) compared with the C group. There were significantly lower values in EF (98.5 ± 6.6 mg/dl, 19.9 ± 5.7 μU/ml, 4.8 ± 1.3), MF (102.2 ± 9.0 mg/dl, 20.2 ± 5.9 μU/ml, 5.4 ± 1.3), and EMF (101.6 ± 7.9 mg/dl, 17.1 ± 3.4 μU/ml, 4.2 ± 0.7) groups, respectively, compared with the F group. 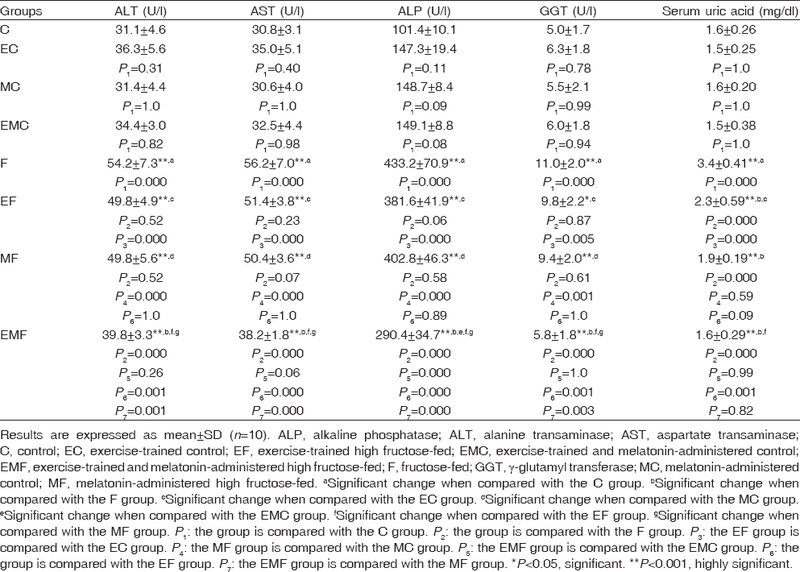 There was an insignificant difference between MF and EF groups and among control groups [Table 1]. Regarding lipid profile results, the F group showed significantly higher serum cholesterol (126 ± 14.4 vs. 100 ± 7.4 mg/dl), TG (74 ± 8.2 vs. 62 ± 4.9 mg/dl), and LDL (79 ± 11.6 vs. 47 ± 9.0 mg/dl) as well as significantly lower HDL (31 ± 4.2 vs. 40 ± 4.7 mg/dl) compared with the C group. There was an insignificant difference between EF and F groups. In the MF group, serum cholesterol (108 ± 7.3 mg/dl) and LDL (62 ± 7.8 mg/dl) were significantly lower than in the F group, whereas serum TG (69 ± 3.4 mg/dl) and HDL (32 ± 4.0 mg/dl) were insignificantly different when compared with the F group. The EMF group showed significantly lower serum cholesterol (99 ± 6.7 mg/dl), TG (58 ± 5.3 mg/dl), and LDL (40 ± 2.2 mg/dl) levels compared with F and EF (120 ± 6.4, 67 ± 5.8, 70 ± 6.8 mg/dl, respectively) groups and significantly higher HDL levels (46 ± 7.9 mg/dl) compared with F and MF groups. EC and EMC groups showed significantly lower serum cholesterol (83 ± 8.2, 86 ± 3.8 mg/dl, respectively), TG (41 ± 5.8, 50 ± 3.4 mg/dl, respectively), and LDL (26 ± 9.9, 21 ± 4.2 mg/dl, respectively) levels and significantly higher HDL levels (49 ± 2.3, 55 ± 4.4 mg/dl, respectively) compared with the C group [Table 1]. Regarding serum liver enzymes, the F group showed significantly higher alanine transaminase (54.2 ± 7.3 vs. 31.1 ± 4.6 U/l), aspartate transaminase (56.2 ± 7. vs. 30.8 ± 3.1 U/l), alkaline phosphatase (433.2 ± 70.9 vs. 101.4 ± 10.1 U/l), and γ-glutamyl transferase (11.0 ± 2.0 vs. 5.0 ± 1.7 U/l) levels compared with the C group. There was an insignificant difference between values in F and EF (49.8 ± 4.9, 51.4 ± 3.8, 381.6 ± 41.9, 9.8 ± 2.2 U/l, respectively) or MF (49.8 ± 5.6, 50.4 ± 3.6, 402.8 ± 46.3, 9.4 ± 2.0 U/l, respectively) groups, whereas the EMF group showed significantly lower values (39.8 ± 3.3, 38.2 ± 1.8, 290.4 ± 34.7, 5.8 ± 1.8 U/l, respectively) compared with F, EF and MF groups. There was an insignificant difference among control groups [Table 2]. In addition, the F group showed significantly higher serum uric acid levels (3.4 ± 0.41 vs. 1.6 ± 0.26 mg/dl) compared with the C group. There were significantly lower values in EF (2.3 ± 0.59 mg/dl), MF (1.9 ± 0.19 mg/dl), and EMF (1.6 ± 0.29 mg/dl) groups compared with the F group. There was an insignificant difference between MF and EF groups, as well as among control groups [Table 2]. In addition, high fructose feeding was associated with oxidative stress, as evidenced by a significantly higher serum MDA (8.0 ± 4.6 vs. 3.3 ± 0.8 nmol/ml) and significantly lower antioxidant enzymes – hepatic SOD (15.1 ± 2.8 vs. 24.3 ± 5.0 U/g tissue), catalase (0.57 ± 0.11 vs. 0.94 ± 0.11 U/g tissue), and GPx (21.3 ± 6.1 vs. 38.8 ± 12.9 U/g tissue) – in the F group when compared with the C group. Swimming exercise and/or melatonin improved fructose-induced oxidative stress, as evidenced by a significantly lower serum MDA levels in EF (5.2 ± 1.3 nmol/ml), MF (5.3 ± 1.5 nmol/ml), and EMF (5.0 ± 0.9 nmol/ml) groups and significantly higher antioxidant enzyme activities – hepatic SOD, catalase, and GPx – in EF (21.9 ± 3.3, 0.80 ± 0.07, 38.8 ± 12.9 U/g tissue, respectively), MF (23.1 ± 6.5, 0.81 ± 0.07, 40.8 ± 14.3 U/g tissue, respectively), and EMF (24.0 ± 4.8, 0.92 ± 0.08, 40.8 ± 11.0 U/g tissue, respectively) groups compared with the F group. 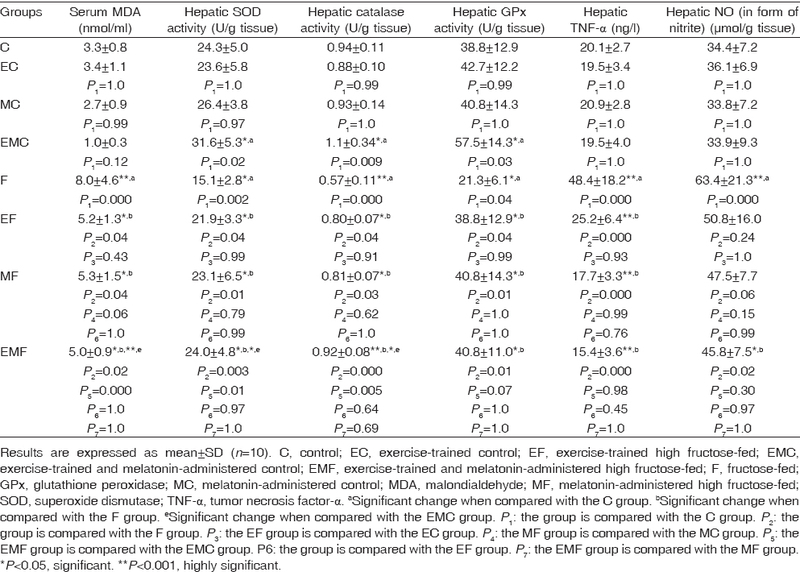 There was an insignificant difference between MF and EF groups and among control groups, except for significantly higher antioxidant enzyme activities – hepatic SOD, catalase, and GPx – in the EMC group (31.6 ± 5.3, 1.1 ± 0.34, 57.5 ± 14.3 U/g tissue, respectively) compared with the C group [Table 3]. Furthermore, the F group showed significantly higher hepatic TNF-α (48.4 ± 18.2 vs. 20.1 ± 2.7 ng/l) and hepatic NO (63.4 ± 21.3 vs. 34.4 ± 7.2 μmol/g tissue) compared with the C group. 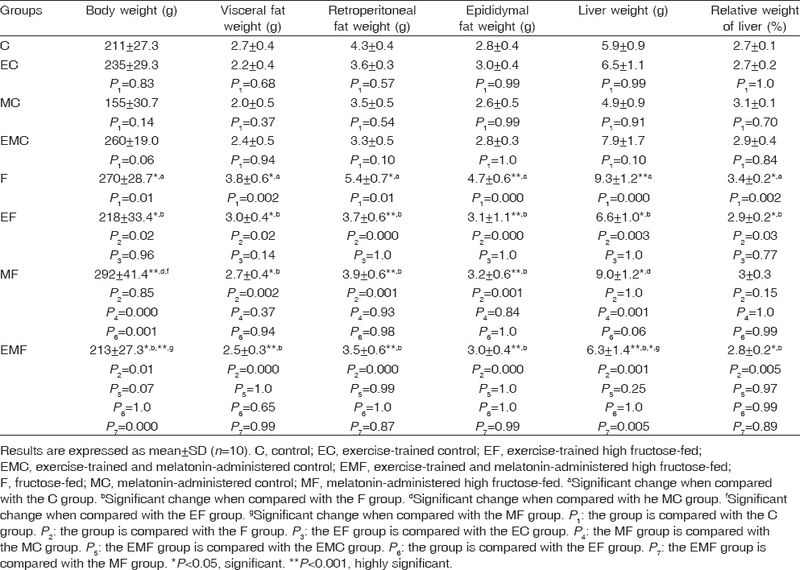 There was significantly lower hepatic TNF-α in EF (25.2 ± 6.4 ng/l), MF (17.7 ± 3.3 ng/l), and EMF (15.4 ± 3.6 ng/l) groups compared with the F group. Regarding NO levels, there were insignificant differences between F and EF (50.8 ± 16.0 μmol/g tissue) or MF (47.5 ± 7.7 μmol/g tissue) groups, whereas the EMF group showed significantly lower values (45.8 ± 7.5 μmol/g tissue) compared with the F group. There was an insignificant difference between MF and EF groups, as well as among control groups [Table 3]. The F group showed significantly higher body weight (270 ± 28.7 vs. 211 ± 27.3 g) as well as visceral fat (3.8 ± 0.6 vs. 2.7 ± 0.4 g), retroperitoneal fat (5.4 ± 0.7 vs. 4.3 ± 0.4 g), and epididymal fat (4.7 ± 0.6 vs. 2.8 ± 0.4 g) weights compared with the C group. There were significantly lower values in EF (218 ± 33.4, 3.0 ± 0.4, 3.7 ± 0.6, 3.1 ± 1.1 g, respectively), MF (292 ± 41.4, 2.7 ± 0.4, 3.9 ± 0.6, 3.2 ± 0.6 g, respectively), and EMF (213 ± 27.3, 2.5 ± 0.3, 3.5 ± 0.6, 3.0 ± 0.4 g, respectively) groups than in the F group. There was an insignificant difference among control groups and between MF and EF groups, except for a significantly lower body weight in the EF group than in the MF group. In addition, the F group showed significantly higher liver weight (9.3 ± 1.2 vs. 5.9 ± 0.9 g) and relative weight of the liver (3.4 ± 0.2 vs. 2.7 ± 0.1%) compared with the C group. The values in EF (6.6 ± 1.0 g, 2.9 ± 0.2%) and EMF (6.3 ± 1.4 g, 2.8 ± 0.2%) groups were significantly lower than that in the F group. There was an insignificant difference among control groups and between MF and EF groups [Table 4]. 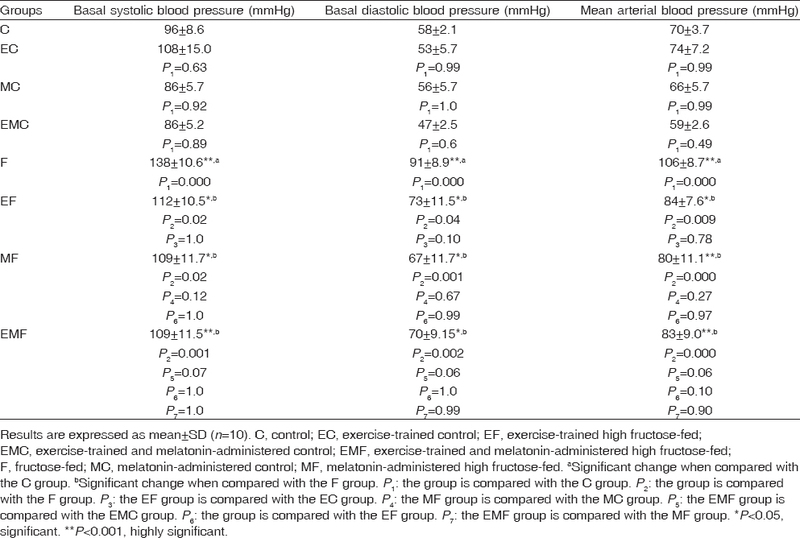 The F group showed significantly higher systolic (138 ± 10.6 vs. 96 ± 8.6 mmHg), diastolic (91 ± 8.9 vs. 58 ± 2.1 mmHg), and mean ABP (106 ± 8.7 vs. 70 ± 3.7 mmHg) compared with the C group. There were significantly lower values in EF (112 ± 10.5, 73 ± 11.5, 84 ± 7.6 mmHg, respectively), MF (109 ± 11.7, 67 ± 11.7, 80 ± 11.1 mmHg, respectively), and EMF (109 ± 11.5, 70 ± 9.15, 83 ± 9.0 mmHg, respectively) groups compared with the F group. There was an insignificant difference between MF and EF groups, as well as among control groups [Table 5]. Control diet-fed groups (C, EC, MC, and EMC) showed normal architecture of the liver by H and E. There was mild periportal inflammation in MC and EMC groups, which may be a drug reaction [Figure 1]. High fructose diet feeding for 6 weeks resulted in a picture of steatohepatitis as evidenced by extensive ballooning degeneration of the hepatocytes, periportal fibrosis, and inflammation in the F group [Figure 2]. EF, MF, and EMF groups showed improvement in the histopathological picture of the liver by H and E compared with the F group, as evidenced by minimal or absent ballooning degeneration, less fibrosis, and less inflammatory infiltrate. The EMF group showed marked improvement compared with the EF or the MF group [Figure 3]. 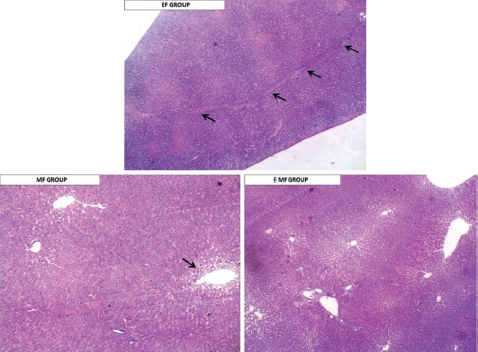 Figure 1: Liver histopathology of the control diet-fed groups. C. group: normal architecture of the liver formed of hepatic lobules comprised of hepatocytes, with eosinophilic granular cytoplasm radially arranged from the central vein. EC group: preserved architecture of the liver. MC group: preserved liver architecture with periportal tract infiltration by inflammatory infiltrate. EMC group: preserved liver architecture with mild periportal inflammation. (H. and. E, ×40 HPF). C, control; EC, exercise-trained control; EMC, exercise-trained and melatonin-administered control; H. and. E, hematoxylin and eosin; HPF, high power field; MC, melatonin.administered control; PV, portal vein. 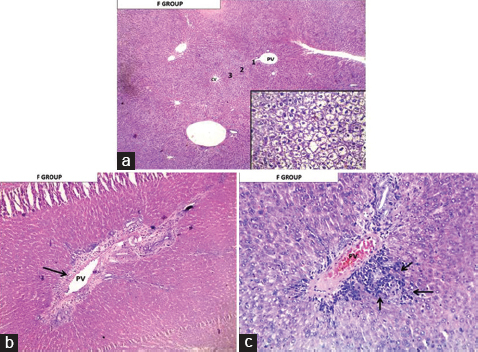 Figure 2: Liver histopathology of the F group. (a) Extensive ballooning degeneration of the hepatocytes. The inset shows the detailed feature of the degenerated hepatocytes showing enlarged vacuolated cytoplasm (H and E, ×40 HPF, inset × 400 HPF). (b) Expanded portal tract by portal and periportal fibrosis, inflammatory infiltrate (black arrow), and bile ducts and ductules proliferation (H and E, ×200 HPF). (c) Severe portal inflammation in the portal tract together with mild interface hepatitis (characterized by a dense lymphocyte and plasma cell infiltrate) (black arrows) (H and E, ×400 HPF). CV, central vein; F, fructose-fed; H and E, hematoxylin and eosin; HPF, high power field; PV, portal vein. Figure 3: Liver histopathology of the fructose-treated groups. EF group: preserved liver architecture with an expanded fibrosed portal tract revealing bridging fibrosis. (portoportal) (black arrows) with noticeable absence of ballooning degeneration of the hepatocytes. MF group: preserved liver architecture with minimal ballooning degeneration of the hepatocytes confined only to the perivenular region around the central vein. (black arrow). EMF group: preserved liver architecture with absence of ballooning degeneration of the hepatocytes. (H. and. E, ×40 HPF). EF, exercise-trained high fructose-fed; EMF, exercise-trained and melatonin-administered high fructose-fed; MF, melatonin-administered high fructose-fed; H. and. E, hematoxylin and eosin; HPF, high power field. Metabolic alterations in fructose-fed rats are quite divergent among different studies. This may be attributed to the different amount, duration, and route of fructose administration or different strain and age of rats . In the present study, high fructose diet feeding for 6 weeks induced features of MS in a rat model, including dyslipidemia, insulin resistance, hypertension, and visceral obesity, which were associated with oxidative stress, hyperuricemia, and impaired liver functions. The mechanisms by which fructose promotes MS focus on its lipogenic nature; it increases plasma TG through several mechanisms, among which is the stimulation of hepatic de novo lipogenesis, which would increase TG deposition in adipose tissues and ectopic tissues, such as liver and muscle, eventually resulting in impaired insulin signaling and dyslipidemia . Fructose-induced dyslipidemia observed in this study agrees with previous studies ,. The improved lipid profile in the EC group agrees with the findings of Ragi et al. , and this may be attributed to the effect of regular exercise on peripheral enzyme activities, such as lipoprotein lipase. In contrast, swimming exercise was unable to reverse fructose-induced dyslipidemia, as claimed by Sakr . This controversy may be due to different modes of MS induction. In addition, melatonin coadministration attenuated the increased serum cholesterol and LDL in fructose-fed rats, which agrees with previous studies ,; however, they reported improvement in serum TG and HDL in fructose-fed rats, which disagrees with our results. This may be attributed to different timing and dose of melatonin administration. On the other hand, Leibowitz et al. reported that daily melatonin coadministration for 5 weeks has no effect on increased serum TG in fructose-fed rats, which agrees with our results. The combined treatment resulted in better improvement in lipid profile. In addition, the F group showed significant increases in body weight as well as visceral fat, retroperitoneal fat, and epididymal fat weights in comparison with the C group, which agrees with the findings of Morsy et al. . Abdominal fat has a direct correlation with insulin resistance, and is a better indicator of obesity-related complications than overall body mass . Swimming exercise significantly reduced body weight in fructose-fed rats, which is in agreement with the findings of Sakr , but it had no effect on body weight in standard diet-fed rats, which is in agreement with the study by Swift et al. . Although there were insignificant decreases in body weight in the MF group, visceral, retroperitoneal, and epididymal fat weights were reduced, which confer cardiometabolic benefits . These results agree with the findings of Kitagawa et al. . Melatonin may regulate body weight through MT1 melatonin receptors . In addition, fructose-induced hyperuricemia in this study agrees with the results of Kitagawa et al. . Hyperuricemia plays a pivotal role in the development of insulin resistance and hypertension in MS through uric acid-induced endothelial dysfunction . The improved hyperuricemia in the MF group agrees with the results of Kitagawa et al. . The combined treatment had better effects compared with the EF group. Furthermore, the fructose-induced oxidative stress in this study, as indicated by significantly higher serum MDA in the F group than in the C group, coincides with the results of Kitagawa et al. The reduced activities of antioxidant enzymes in the F group agrees with the findings of Kamal and Ginseng . Oxidative stress is a potent trigger of insulin resistance in various tissues including muscle, adipose, liver, and endocrine pancreas . The improved oxidative stress in the EF group, as indicated by lower serum MDA and higher hepatic antioxidant enzyme activities, than the F group agrees with the results of Botezelli et al. . Melatonin coadministration also improved oxidative stress in the MF group, as indicated by a reduction in serum MDA and an increase in antioxidant enzyme activities. The decrease in serum MDA agrees with the findings of Abdel-Sater and Hassan . The improvement in antioxidant enzymes in the EMC group, which did not occur in either the EC or the MC group, may be due to synergistic mechanisms between exercise and melatonin. Moreover, fructose-induced insulin resistance in this study agrees with previous reports ,. The underlying mechanisms may be attributed to lipid accumulation in the liver, meta-inflammation, oxidative stress, and hyperuricemia . Swimming exercise significantly decreased fasting blood glucose, insulin, and HOMA-IR index in the EF group in comparison with the F group, which is in agreement with the findings of Sakr , who has attributed insulin resistance improvement to the lowering effect of swimming exercise on circulating adipokines by reducing adipose tissue mass. 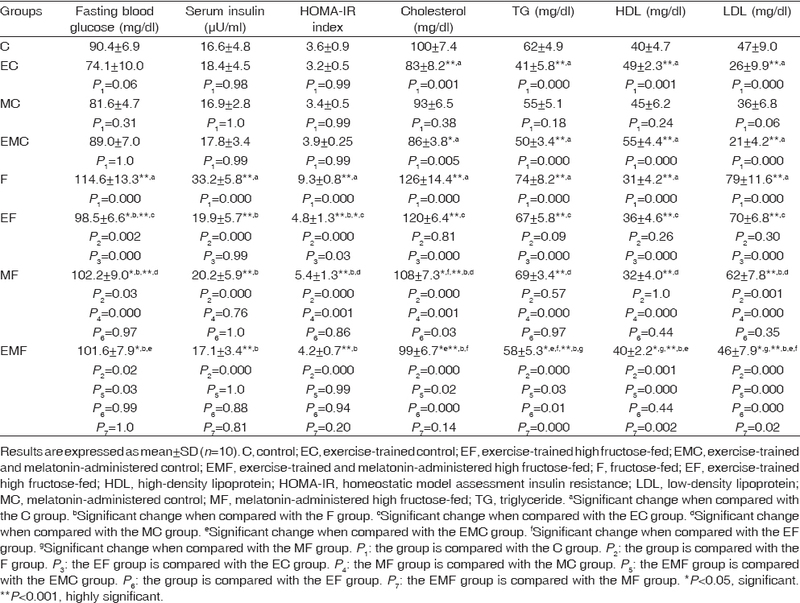 In addition, there were significant reductions in fasting blood glucose and a significant improvement in insulin sensitivity in the MF group in comparison with the F group, which is in agreement with previous studies , but they reported decrease in serum insulin, which disagrees with our results. In another study by Prunet-Marcassus et al. melatonin had no effect on plasma insulin levels but reduced plasma glucose in high fat diet-fed rats, which agrees with our results. The improvement in lipid and glucose regulation in the MF group could be linked to amelioration of oxidative stress, which is an important pathological feature that underlies the development of insulin resistance and MS. At a molecular level, melatonin treatment has been shown to stimulate glucose transport in skeletal muscle . Regarding ABP results, fructose-induced hypertension in this study agrees with some previous studies  and disagrees with other studies . This conflict may be attributed to different study designs. Several mechanisms of fructose-induced hypertension have been proposed, including increased sympathetic nervous system activity, elevated circulating catecholamines, enhanced renin–angiotensin system activity, increased sodium reabsorption, impaired endothelium-dependent relaxation, and increased secretion of endothelin-1 . Concurrent swimming exercise significantly reduced ABP in fructose-fed rats and even normalized it, which is consistent with previous results . However, it had no effect on ABP in the EC group. The effect of exercise on ABP of normotensive animals is minimal . Melatonin coadministration significantly reduced ABP in fructose-fed rats, which agrees with many reports . Melatonin hypotensive effect might be mediated via melatonin receptors or through its anti-adrenergic effects . There is an association between NAFLD and MS as proved in this study. High fructose diet feeding for 6 weeks caused significant increase in liver enzymes, which agrees with the results of Botezelli et al. . In addition, there was a significant increase in liver weight and relative weight of the liver in the F group, which agrees with the results of Kitagawa et al. , significant increase in hepatic NO, which agrees with the results of Altas et al. , and a significant increase in hepatic TNF-α, an inflammatory marker, which agrees with the results of Morsy et al. . Regarding histopathological examination, H and E-stained sections from the F group showed steatohepatitis, which was consistent with the biochemical results and agrees with Ying et al. , who has attributed this picture to accumulation of fat droplets resulting in steatosis with portal inflammation. The present study revealed that swimming exercise had a preventive role against fructose-induced hepatic dysfunction. It significantly decreased liver weight and relative weight of liver in fructose-fed rats, which agrees with Sakr . This was confirmed by H and E-stained liver sections from the EF group. These results agree with the results of Botezelli et al. . The hepatoprotective effect of melatonin against fructose-induced fatty liver in this study, as evidenced by H and E-stained liver sections from the MF group, agrees with Hatzis et al. , who reported that melatonin counters lipid peroxidation and oxidative stress, thus providing a degree of protection against the development of NAFLD. In this study, melatonin had no effect on liver weight and relative weight of the liver in fructose-fed rats, which agrees with Kitagawa et al. . The combined treatment showed better hepatoprotective effect than each treatment alone, which was consistent with the biochemical results. Our results revealed that, when comparing the protective effect of melatonin against swimming exercise, there was an insignificant difference between EF and MF groups regarding all parameters, except for significantly lower serum cholesterol in the MF group than the EF group and significantly lower body weight in the EF group than the MF group. The combined treatment resulted in better improvement in some parameters than each treatment alone, indicating that there is a synergistic effect between swimming exercise and melatonin hormone. There are several studies showing the beneficial effect of melatonin administration in exercise. Adequate levels of circulating melatonin are necessary to improve energetic metabolism efficiency in aging animals, reducing body weight, and increasing insulin sensitivity . In addition, exercise affects plasma melatonin levels, and melatonin levels were higher during aerobic exercise compared with the corresponding time in the sedentary condition . Concurrent swimming exercise and/or melatonin administration improved hepatic dysfunction and some metabolic aspects in a fructose-induced MS rat model, and were even able to reverse some parameters to normal. The combined treatments had better protection compared with each treatment alone in some aspects. Thus, melatonin administration and swimming exercise may serve as a novel approach for MS prevention. Miller A, Adeli K. Dietary fructose and the metabolic syndrome. Curr Opin Gastroenterol 2008; 24:204–209. Botezelli JD, Mora RF, Dalia RA, Moura LP, Cambri LT, Ghezzi AC, et al. Exercise counteracts fatty liver disease in rats fed on fructose-rich diet. Lipids Health Dis 2010; 9:116–125. Ibrahim Nassar OM. Effect of 3-month treatment of obesity by low-calorie diet on anthropometric, health, and nutritional status for obese female individuals. Menoufia Med J 2014; 27:115–121. Grundy SM, Cleeman JI, Daniels SR, Donato KA, Eckel RH, Franklin BA, et al. American Heart Association; National Heart, Lung, and Blood Institute. Diagnosis and management of the metabolic syndrome: an American Heart Association/National Heart, Lung, and Blood Institute Scientific Statement. Circulation 2005; 112:2735–2752. Nduhirabandi F, du Toit EF, Lochner A. Melatonin and the metabolic syndrome: a tool for effective therapy in obesity-associated abnormalities? Acta Physiol 2012; 205:209–223. Moraes-Silva IC, Mostarda C, Moreira ED, Silva KA, dos Santos F, Kátia de Angelis K, et al. Preventive role of exercise training in autonomic, hemodynamic, and metabolic parameters in rats under high risk of metabolic syndrome development. J Appl Physiol 2013; 114:786–791. Sivaraman K, Senthilkumar GP, Sankar P, Bobby Z. Attenuation of oxidative stress, inflammation and insulin resistance by Allium sativum in fructose-fed male rats. J Clin Diagn Res 2013; 7:1860–1862. Kitagawa A, Ohta Y, Ohashi K. Melatonin improves metabolic syndrome induced by high fructose intake in rats. J Pineal Res 2012; 52:403–413. Teixeira L, Flavio R, Sofia B, Rui P, Bruno S, Helena V, et al. Exercise training is associated with improved levels of C-reactive protein and adiponectin in ZDF (type 2) diabetic rats. Med Sci Monit 2004; 13:BR168–BR174. Matthews D, Hosker J, Rudenski A, Naylor B, Treacher D, Turner R. Homeostasis model assessment: insulin resistance and beta cell function from fasting plasma glucose and insulin concentrations in man. Diabetologia 1985; 28:412–419. De Moura RF, Ribeiro C, de Oliveira JA, Stevanato E, De Mello MA. Metabolic syndrome signs in Wistar rats submitted to different high-fructose ingestion protocols. Br J Nutr 2009; 101:1178–1184. Abdel-Sater KAA, Hassan AMM. Effects of combination of carvedilol and melatonin on induced metabolic syndrome in rats. Biochem Physiol 2014; 3:137. Ragi MM, Nazmy WH, Aziz NM. Effects of twelve weeks of swimming exercise program on hepatic and cardiac oxidative status, liver functions and some cardiovascular risk factors in a rat model of high fat diet-induced obesity. MJMR 2013; 24:1–6. Sakr HF. Modulation of metabolic and cardiac dysfunctions by swimming in overweight rats on a high cholesterol and fructose diet: possible role of adiponectin. J Physiol Pharmacol 2013; 64:231–240. Leibowitz A, Peleg E, Sharabi Y, Shabtai Z, Shamiss A, Grossman E. The role of melatonin in the pathogenesis of hypertension in rats with metabolic syndrome. Am J Hypertens 2008; 21:348–351. Morsy MD, Khashaba AS, Agamy AI, Refaat A. Effect of pioglitazone on hepatic ultrastructure and metabolic changes induced by a high sucrose diet in rats. Am J Appl Sci 2014; 11:1087–1098. Abdullah MM, Riediger NN, Chen Q, Zhao Z, Azordegan N, Xu Z, et al. Effects of long-term consumption of a high-fructose diet on conventional cardiovascular risk factors in Sprague-Dawley rats. Mol Cell Biochem 2009; 327:247–256. Swift DL, Johannsen NM, Lavie CJ, Earnest CP, Church TS. The role of exercise and physical activity in weight loss and maintenance. Prog Cardiovasc Dis 2014; 56:441–447. Kamal SM. Ginseng (G115) improves metabolic syndrome and some antioxidant enzymes in albino rats. J Pharmacol Res 2013; 3:54–58. Tirosh A, Rudich A, Potashnik R, Bashan N. Oxidative stress impairs insulin but not platelet derived growth factor signalling in 3T3-L1 adipocytes. Biochem J 2001; 355:757–763. Botezelli JD, Cambri LT, Ghezzi AC, Dalia RA, Scariot PP, Ribeiro C, et al. Different exercise protocols improve metabolic syndrome markers, tissue triglycerides content and antioxidant status in rats. Diabetol Metab Syndr 2011; 3:35. Kolderup A, Svihus B. Fructose metabolism and relation to atherosclerosis, type 2 diabetes, and obesity. J Nutr Metab 2015; 2015:823081. Prunet-Marcassus B, Desbazeille M, Bros A, Louche K, Delagrange P, Renard P, et al. Melatonin reduces body weight gain in Sprague Dawley rats with diet-induced obesity. Endocrinology 2003; 144:5347–5352. Abdulla MH, Sattar MA, Johns EJ. The relation between fructose-induced metabolic syndrome and altered renal haemodynamic and excretory function in the rat. Int J Nephrol 2011; 2011:934659. Medeiros A, Oliveira EM, Gianolla R, Casarini DE, Negrão CE, Brum PC. Swimming training increases cardiac vagal activity and induces cardiac hypertrophy in rats. Braz J Med Biol Res 2004; 37:1909–1917. Altas M, Var A, Köse C, Özbilgin K, Ari Z. Endothelial dysfunction in high fructose containing diet fed rats: Increased nitric oxide and decreased endothelin-1 levels in liver tissue. Dicle Med J 2010; 37:193–198. 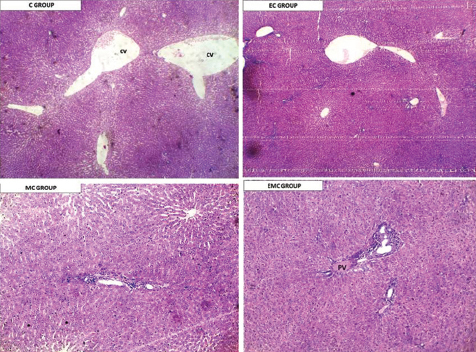 Ying A, Liu Y, Bing Y, Wang Z, Zang J, Yu C. Dietary quercetin ameliorates nonalcoholic steatohepatitis induced by a high-fat diet in gerbils. Food Chem Toxicol 2013; 52:53–60. Hatzis G, Ziakas P, Kavantzas N, Triantafyllou A, Sigalas P, Andreadou I, et al. Melatonin attenuates high fat diet-induced fatty liver disease in rats. World J Hepatol 2013; 5:160–169. Mendes C, Lopes AMS, do Amaral FG, Peliciari-Garcia RA, Turati AO, et al. Adaptations of the aging animal to exercise: role of daily supplementation with melatonin. J Pineal Res 2013; 55:229–239. Baehr EK, Eastman CI, Revelle W, Olson SH, Wolfe LF, Zee PC. Circadian phase-shifting effects of nocturnal exercise in older compared with young adults. Am J Physiol Regul Integr Comp Physiol 2003; 284:R1542–R1550.